While it was always possible to drive the point of a sword through the steel rings of a chain maille shirt, or to shear it with a strong blow. This often caused the damaged rings to drive deep into the wound, allowing for infection to set in. A thick, padded garment, such as this one was worn beneath a tabard or a maille shirt to reduce the risk of this type of life threatening injury. 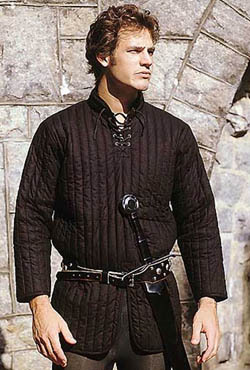 This gambeson is appropriate for wear with period ensembles form the Middle Ages to the Renaissance. Black only, made in 100% cotton. Neck 15" - 15.5" 16" - 16.5" 17" - 17.5"
Chest 38" - 40" 42" - 44" 46" - 48"
Waist 32" - 34" 36" - 38" 40" - 42"
Sleeve 33.5" - 34" 34.5" - 35" 35.5" - 36"